The Samsung Cup is a prestigious international Go competition held every year since 1996 and it’s one of the toughest Go tournaments as top class players from Korea, China , Japan , Taiwan and even amateurs can take part in the preliminary rounds and compete in the final stage to win attractive prizes of almost 300.000 us$ which makes it comparable with the major titles in Japan like Kisei, Honinbo and Meijin. The official name of the tournament is The Samsung Fire & Marine Insurance World Masters Baduk. The host of this big international event is Hankuk Kiwon ( Korean Baduk Association ) which is located in Seoul, S. Korea. Usually the format of the Samsung Cup starts with a preliminary tournament where top pro players and top amateurs are invited to play in order to qualify for the last 32 players main event which is a Knock-Out tournament with best of 3 games played in the finals. 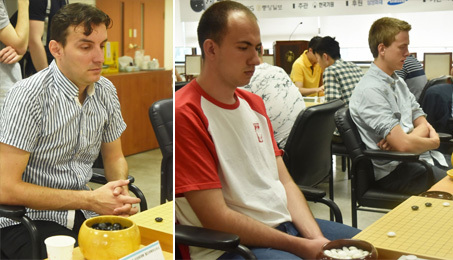 This year’s World Division preliminary rounds were held in S. Korea at Hankuk Kiwon from july 17 till july 20 and 1 player got the seat for the final stage of the tournament. Among the 12 players who took part in the qualification there were 4 european players who joined as well: Ali Jabarin 1p from Israel, Pavol Lisy 1p from Slovakia, Mateusz Surma 1p from Poland and Cornel Burzo 6d from Romania. Only 8 players took part in the 1st round, including 3 of the Europeans. The other 4 players got automatically seated in the 2nd round and played the winners from the first round . It was quite impressive that all 4 european players managed to get in the last 4 to compete for the seat in this Samsung Cup great event. 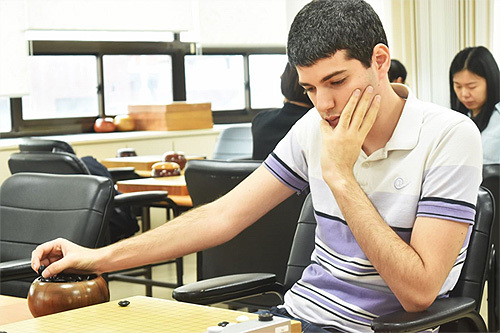 Congrats to the winner of this year’s World Division Ali Jabarin 1p and let’s hope he will make a great performance in the Samsung Cup tournament along with top pros like Ke Jie 9p, the winner of this big event in 2015.